I'm always intrigued by new and versatile products that can easily add flavor to almost any recipe. 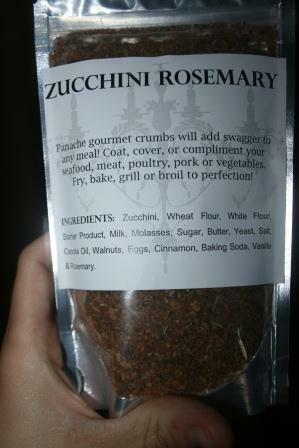 So when I heard about a new company called Panache Pantry and their gourmet bread crumbs, I was eager to try them. The best part? They have no preservatives and no fillers - just real ingredients. I decided to really put them to the test. 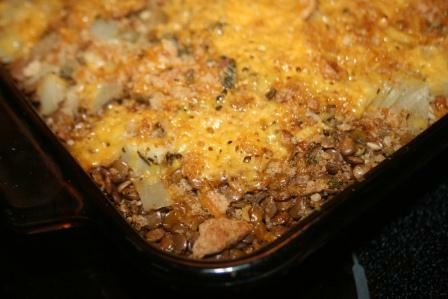 I have a lentil casserole that is easy to make and economical, but it isn't the most exciting dish on the block taste-wise. It's a dish with a major case of the blandies. So I prepped the casserole like normal, but then sprinkled the Sicilian Whole Wheat bread crumbs on top, followed by some grated Cheddar cheese. It truly added so much in the flavor department! I don't think I'll ever be able to make the old version of lentil casserole again, after trying it with Panache Pantry's bread crumbs on top. The zucchini rosemary has a slight sweetness with a twist of salty to it, so we're going to try that on top of grilled sweet potatoes next time we make them. The possibilities are endless - try them on seafood, meats, chicken, as a topping to jazz up some steamed broccoli - or even on eggs. I love that I now have a natural product that I can use to add a new twist to my old standby dishes. Would you like to win some to try? Panache Pantry has been generous enough to offer a giveaway to one lucky winner, who will receive one 4 oz. package of Pumpkin Cajun and one 4 oz package of Zucchini Rosemary to try. To enter, just click on the "read more" beneath my signature. Disclaimer: I was provided with two packages of gourmet bread crumbs for review purposes. The opinions stated above are my own. I would love to try these breadcrumbs on my recipe for hot chicken salad. It's a wonderful recipe, but I have made it for years and would like to add a little pazazz for a change. This looks like a wonderful product! oh thanks for sharing this, and I plan to look it up and try out some of their products. Looks great! Have a lovely day! So very interesting. Thanks for telling us about these products. I feel like homemade mac and cheese would be awesome with these bread crumbs! Very interesting combination of flavors, it is always nice to have something new to try. I bet those are good. Those bread crumbs sound like they would add some pop to a whole lot of dishes!! I would use them in many things, but one would be meatloaf. My son-in-law has a cauliflower recipe that calls for bread crumbs. I bet this would give his very bland dish a kick. These would be good on so many dishes-I'd like to use them on my oven baked chicken recipe! I appreciate that they are all natural. These sound good on fresh salad greens! These would be great to use on top of casseroles. I can smell it cooking, and we want some NOW! awk, I don't ever get how to enter on those forms. I think I did it? I can think of many uses including for breading garden zucchini and onions. I would love to use these for mac n cheese topping. I would try them on my chicken cutlets! I would use them in some vegetables dishes. I'd use these top top baked fish. I would love to coat chicken breasts in them before baking! I probably use them on chicken or veggies. I would like to top a casserole.